Does it seem like macramé, greenery and earthy pottery are suddenly everywhere? They’re signs of one of the year’s biggest home trends: organic and bohemian décor. This week, our Spring Design Session covered how to weave the trend into your home, and we’re recapping our top tricks and tips today on the blog. Organic and bohemian décor pulls inspiration from nature. Natural materials include everything from woven rugs and baskets to wood furniture and foliage. Jute is a versatile fibre, and one of our favourite natural materials to use this year. Woven jute has an earthy look, and it’s strong enough to be used in pieces that get frequent wear – like our Acosta Pouf, Delgado Floor Cushion, and Shiva Rug. Woven baskets made from seagrass or rope offer a functional way to incorporate natural materials into your home. For a softer approach, you can use natural weaves like cotton and wool. In throws, accent pillows and area rugs, these materials provide warmth and texture alongside boho style. Décor doesn’t have to be woven to be inspired by nature. This trend also embraces organic shapes and “imperfect” pieces. Accents like vases may be asymmetrical, textured, ridged or rough. Ceramic décor with rough edges and irregular shapes are interesting all on their own, even without flowers or branches. Foliage is one of the easiest ways to bring home an organic style. For an unfussy, organic look, accessorize with simple branches and leaves. These can be real pieces cut from your outdoor plants, or faux foliage that’s around whenever you need it. Larger potted plants like a Fiddle Leaf Tree or Monstera help fill up bare looking rooms with lush green foliage. Use woven storage baskets to hide basic plastic pots, make it easier to move plants and keep soil off your floor. Today’s boho trend is all about texture – the more the better! This means you’ll want to incorporate textiles like accent pillows, throws and area rugs. Adding textured décor is an easy way to give your room a subtle boho feel without changing up the entire space. In a room that already features colourful accents, textured neutrals won’t clash with your existing colour palette. Poufs and floor pillows create a casual look and are perfect for adding texture to the room. To get a next-level boho look, layer textured pillows and throws together. Variation is the key to making textured pieces work together. Combine different textures like macramé, embroidery and woven fibres for an easy, eclectic look. Texture doesn’t just belong on accents. Furniture with woven texture, like our Fresno Conversation Set, brings boho style that can transition from patio to living room. 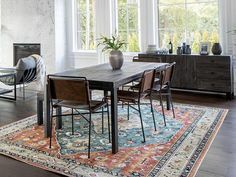 This set is the perfect foundation for layering textiles, and both tables and chairs work as indoor accent pieces during cooler months. Boho style might bring to mind a wild mix of every colour and pattern imaginable. That works for a few daring home designers, but most of us are looking for a more subtle way to get the look. By working within a specific colour palette, you can create a cohesive look even when you mix and match accents and prints. To keep your pattern mixing pleasing to the eye, intersperse solids and patterns in the room. Consider placement. Pairing a patterned accent with something solid is an easy way to create a cohesive feel, like with two accent pillows in one corner of a sofa. For more visual interest, use solid colours with texture. Different patterns work well together when they’re on a different scale. A large-scale floral and small-scale geometric pattern will pair better than two different patterns that are both small scale. Accents with similar patterns can live in the same room, just not right next to each other. A surprisingly easy trick to test if patterns can be paired: put them next to each other and squint! If you can’t distinguish between the pieces, they’re too similar to live side by side. Can’t get enough of organic + boho décor? Save 20% on home accessories from now until March 31!